Mandas Disney Blog: The Disney Cruise Line! Hi there! And welcome to the last in my Disney Summer Fun Series! Can you believe it!? I can't!! Today I have an awesome Guest ... Tricia from Return to Disney!! And I just love her blog Return to Disney! Tricia covers everything! How to bring Disney Magic home, Disney Memories, Disney Dining, Disney Resort information and Disney Vacation Planning! Tricia also covers the topic of Autism. 2 of her 4 (adorable!) kids have an Autism Spectrum Disorder and she shares her journey with them in everyday life, as well as at Disney Parks! This post in particular was so touching - it shows the true real life magic that Disney can bring! Tricia as also recently launched her own Travel Agency! It's called 'Take a Break Vacations' - please be sure to check it out! Tricia plans customized vacation getaways :) She specializes in Disney and Universal Resorts, as well as all-inclusive resort vacations for busy families and individuals. Her site also features some information on Adventures by Disney in Ireland and Royal Caribbean Cruises! Congratulations Tricia! I wish you every success in your awesome venture! It's Tricia from Return to Disney! Most people who visit Walt Disney World go for about a week. You can certainly spend more time and still not experience everything there is to see and do there, but that’s the average. A Walt Disney Word vacation is wonderful, but it’s not usually relaxing. Some people actually begin training for their vacation several months in advance, because they know how much walking they’ll do! A relaxing cruise is a great way to recover from your vacation. If you have the time and you’re just not ready to leave the Disney magic behind, you can extend your vacation with a three or four night cruise on the Disney Cruise Line. The Disney Cruise line sails to the Bahamas out of Port Canaveral, Florida – about 65 miles away from Walt Disney World Resort. You’ll spend your first day traveling from Florida to Nassau, Bahamas where you’ll have most of the second day to explore. 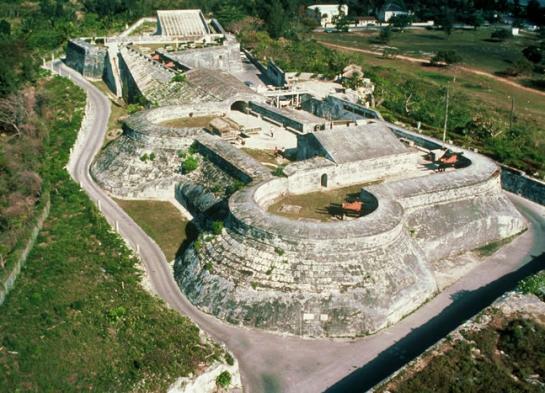 If you’re interested in the colonial and pirate history of the Bahamas, visit Fort Charlotte where you can tour the moat, underground tunnels and dungeons. If shopping and sightseeing is more your speed, check out Bay Street and Straw Market where you can find handmade souvenirs and artisan foods. After Nassau, you’ll sail to Castaway Cay, Disney’s private island about 200 miles off the coast of Florida. There’s plenty to keep you busy on Castaway Cay for a full day before you return to Port Canaveral, from feeding stingrays to a relaxing massage in an open-air cabana. There are separate adult and kid beaches, as well as a family oriented area. Yours won’t be the only ship docked at Castaway Cay – the Flying Dutchman from Pirates of the Caribbean lurks around the island. Four night cruise itineraries give you an extra day at sea before returning home, giving you time to explore all the activities and amenities available on board the Disney Dream or Disney Magic, which will launch in 2012. Don’t miss the AquaDuck – 765 foot water coaster that drops you four decks into a lazy river! And as if all that wasn’t tempting enough, you’ll also get a $25 onboard credit – but you might have trouble using it since just about everything you could possibly want is included in the price of your cruise. Isn't that a brilliant idea!? I know from experience that whilst a Disneyland Paris trip can be the most wonderful holiday in the world! ... I can come home feeling very tired and worn out! :P A Disney cruise at the end of my Dlp trip would be just perfect ... if only they left from France! lol! Once again, thank you SO much Tricia for being my Guest! Please be sure to check out her wonderful Disney blog Return to Disney! And also her brand new travel agency website 'Take a Break Vacations'! Great post! Man, I would love to cruise! Manda - I think they have European Cruises... or are planning on them? zaylyn, you'll have a blast on a Disney cruise! I'd be happy to help you explore all your options. Great post. Once my wife and I are debt free we are doing a Disney Cruise. We will probably go back into debt because of the cruise but it will be worth it! There is a Europen cruise DisneyBabies! But it leaves from Spain! Would be so much cooler to leave from France so that you could follow a Dlp trip with a Disney cruise more easily! :P That's so cool Aimee! I'm jealous!! :P SO worth it DisneyMac ... I'm no stranger to coming back from Dlp skinto myself! :P lol!